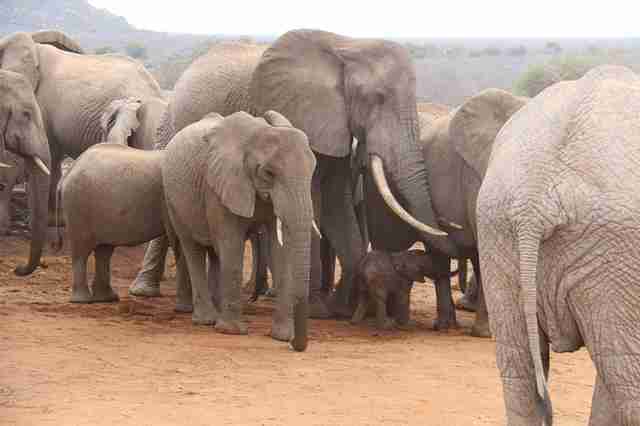 All the other elephants gathered around to play nanny. 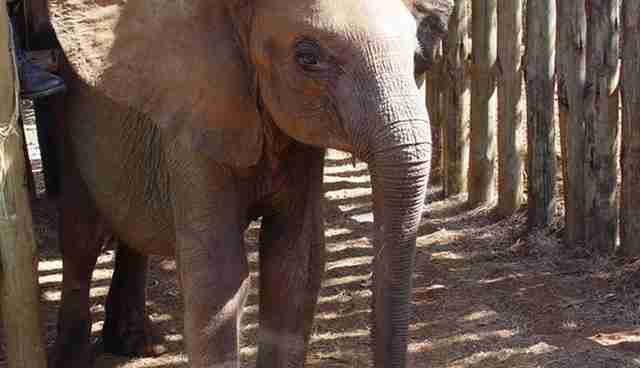 Twelve years ago, Galana arrived at the David Sheldrick Wildlife Trust (DSWT) as an orphaned elephant. 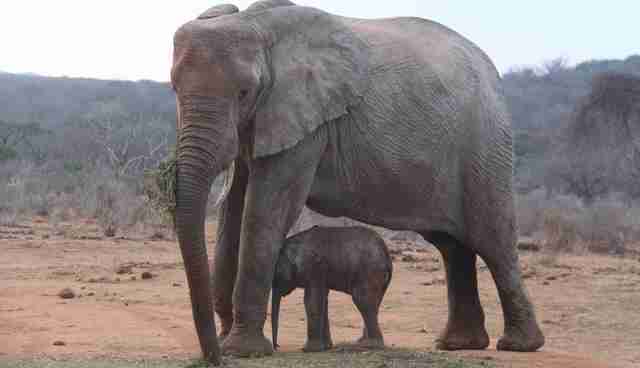 She'd been found alone in a patch of thick saltbush at the border of the Tsavo National Park in Kenya. 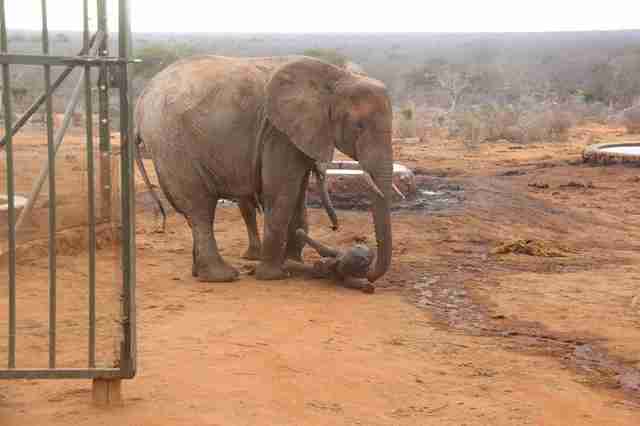 She was fragile, weak and scared to not be with her mother, who'd probably been killed by poachers. With the help of DSWT, Galana grew up from being a milk-dependent 1-year-old calf to a healthy young adult. In 2011, Galana made the decision to return back to the wild, and she's been living with a herd of elephants led by another former orphan named Yatta. Galana may be a wild elephant now, but she periodically visits DSWT's Ithumba Reintegration Unit, where she spent her last years as an orphan. 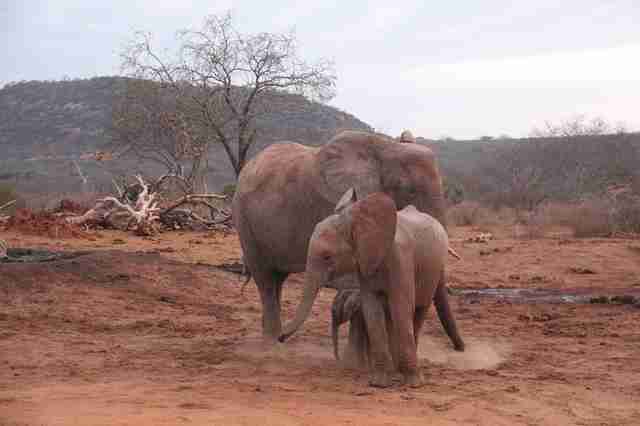 "The females typically visit more than the bulls," Amie Alden of DSWT told The Dodo. "Yatta's group, which includes Galana, typically visits every other month." On her latest visit to the Ithumba Reintegration Unit, Galana had the biggest surprise to share. One early September morning, the keepers spotted Galana and a group of bulls lingering outside the stockades. As the keepers drew closer, they noticed Galana had a baby with her - her baby. 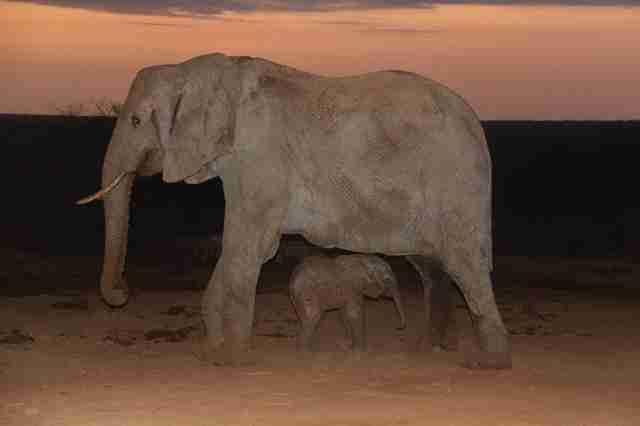 The baby was only a few hours old, which meant that Galana had given birth nearby. When the keepers opened the stockades, two of the dependent orphans, Laragai and Narok, rushed out to meet the duo. Shortly after that, former orphans arrived to join in the celebration. 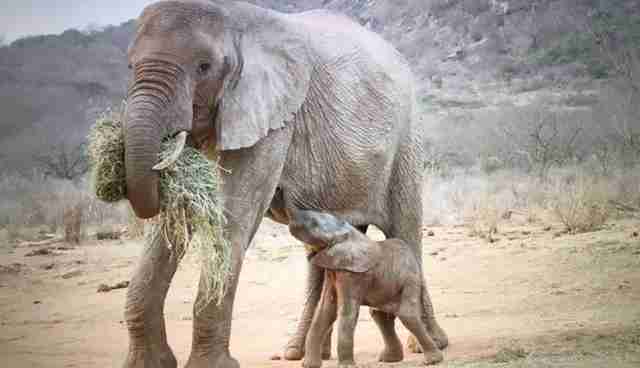 "They were so excited and overcome with joy of a new baby in the fold, trumpeting and charging around celebrating," DSWT wrote in a Facebook statement. "Throughout the day Galana was surrounded by ex-orphans and wild elephants alike who have taken on the role of nanny to newborn Gawa." The team at DSWT named Galana's baby "Gawa" because it means "to share" in Swahili. "We're happy to see Galana living the life she should and enjoying the magical milestone of becoming a mother for the first time," Alden said. "We're proud to have afforded her a second chance after she was orphaned and to provide a safe environment for her to bring up Gawa, protected by the DSWT/KWS Anti-Poaching Teams and our Aerial Surveillance." "We hope that Gawa lives a long and happy life, free from threat and harm," said Alden, "and that she one day becomes a mum herself and roams far and wide under the protection of our field teams." 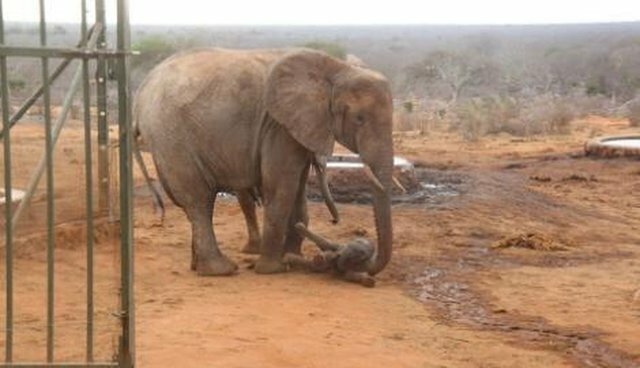 The David Sheldrick Wildlife Trust rescues individual orphaned elephants because they know rescuing individuals can help save the species. If you want to see more magical moments like this, you can support DSWT by donating here.